In my many years of owning above ground pools I have used all three types of filters. Sand filters, diatomaceous earth filters, and cartridge filters. Diatomaceous earth is an excellent filtering agent. Diatomaceous earth filters have also come a long way over the last thirty years. In the early days you would have to remove the filter elements, hose them down, and then recoat the system with diatomaceous earth. As these filters have progressed the cleaning part has become much easier. There is still the cost of recharging the system with every cleaning. This is probably the reason for the decrease in popularity over the years. The reason people still use them is their great ability to clean the water. DE filters clean to about 6 microns of dirt compared to 20 for a cartridge filter and 60 for a sand filter. 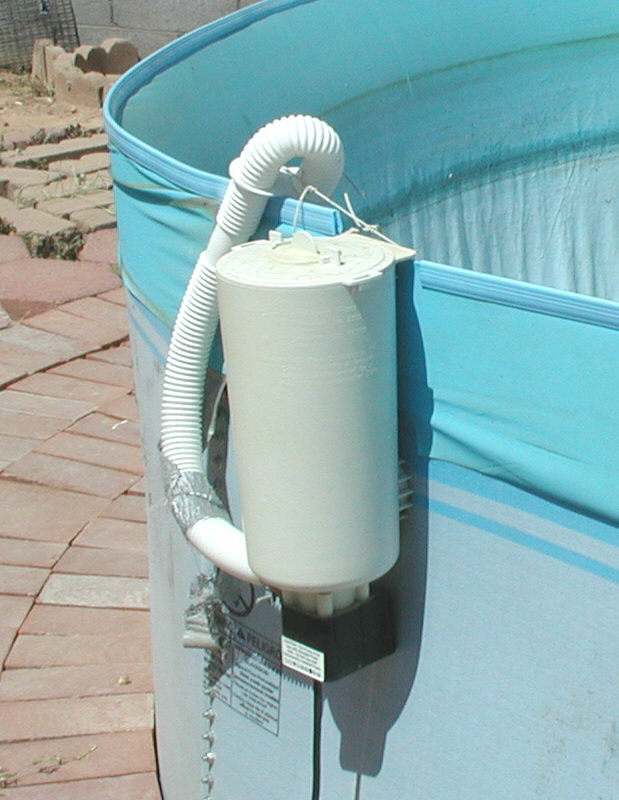 My favorite system for cleaning an above ground pool would be the Perflex DE filter system. I owned one of the very first Perflex filters. It was a store demo and the tank was clear so the inside movements could be demonstrated. This was an outstanding system, keeping my pool clean for many years. Cartridge filters are still very popular. They are the least expensive and tend to come as standard equipment with low end pools. The downside to the cartridge filter is having to open up the system, removing the cartridge and hosing it off to clean it. It is time consuming and a little messy, but an affective system if you clean the filter weekly and replace the cartridge yearly. The cartridge filter is the second best filtering agent just behind diatomaceous earth. There are, of course, high quality cartridge filters and many pool owners swear by them. There are even some towns that have outlawed all other types of filters. The reason for this is that cartridge filters are the only ones you do not have to backwash. Water is becoming a great concern in some places. The Easy-Clear cartridge filter is a good solid filter. I had the pleasure of installing hundreds of these over a period of a few years when they were the filter of choice for one of the pool stores I worked for. The installation was as easy as it gets and I very seldom had to do any service work on the systems. The cartridge removes easily for cleaning and the top seals up nicely each time you close it. Having used them all over the years my personal favorite is the sand filter. You simply shut the pump off, move a rotary valve, restart the pump and backwash until the sand is clean. Sand media filters are fast and very efficient, they are also the most popular filters sold with above ground swimming pools. I much prefer the ease of operation and the great filtering qualities of a sand filter. I guess I just don't mind swimming around with that invisible dirt that is all of 60 microns. I water my trees with the backwash so I don't feel guilty there, and I am really lazy. This system is just too easy to maintain. I love the Pro Series sand filters. The Hayward series of sand filters has been the filter of choice for a pool store I have done installations for going back 30 or more years. I have installed thousands of them and owned several. I almost feel like an expert on the system. Hayward is a leading brand in the pool industry making a wide variety of products for above ground as well as in ground pools. They are a top of the line and well respected company. Like most companies they are not without their shortcomings. Let's look at some Hayward filter reviews and talk about them. I was not at all surprised to find page after page of five star reviews for what I consider the best filter for above ground pools. Great product! Comes with everything. We used this to replace the pool pump filter system that was worn out. All parts were of higher quality than the older other brand. Hoses fit well with no leaks. pump provides outstanding suction for cleaning the pool as well. Excellent!! I have this hooked up to a 27' round pool and it is fantastic. Highly impressed!! I bought this system to install on a 24'x54" pool. It works great. Water flow is strong came with everything we needed. I can't speak for the long term but it seems to be well built! We actually have it running to a Intex saltwater system, instead of a Hayward salt system. Still works amazingly. Would buy again. 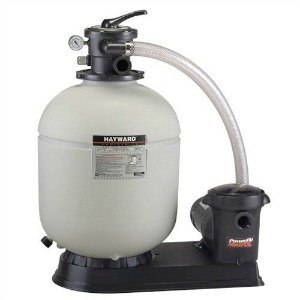 We ordered this to replace our 20 year old Hayward sand filter. It's been installed for about a week and the water looks great!! Instructions are not very clear but hubby was able to figure it out. Excellent product as I always expect from Hayward. I had moved into a house about a year ago that had a pool and the equipment was old and any part I tried to find for the pump and/or filter was discontinued. I decided to purchase a new filter system for opening the pool this year and found this to be cheaper then a lot of places and it was the Hayward name. Everything connected perfectly and setup was a breeze. Did have a few minor leaks after setup but this is common most of the time. A little bit of Teflon tape or Permatex #2 fixes those up nicely. There were, however, more negative reviews than I thought I would find. One review mentions a pump to filter hose missing, that happened to me three times this past pool season. Quality control at Hayward, tighten it up a little. The other thing that stands out is the number of cracked tanks, this does not happen here in Arizona. These systems outlast the pools in many cases. We have summers with many days over 110 degrees and a handful of winter days below freezing. Given this I am thinking the tanks are cracking due to extreme cold. Close the pool as early fall as you can and don't open until well past the last freeze. When the pool is closed store the filter equipment indoors. I bought this filter on June 5th 2015 and it worked great for the 2015 season... when I opened my pool this year it worked good for a few days and now there is a crack in the seam...this is not a cheap product so there is no reason for this to happen.. I am very disappointed...and now after reading the other reviews I see I am not the only one this is happening to. Ordered this a short while ago to replace a much smaller pump in a 24' pool. Works great, but didn't include installation instructions, and shipment failed to include the hose that connects from the pump tongue filter. Currently resolving. Also, I can't find a power switch on the motor itself. No big deal to me because I use a timer on my power chord. Definitely is quieter than my last pump. A great value if you don't want to totally break the bank. That power switch is the systems best kept secret, stick you hand under the rear of the pump and sure enough, it's there.